PGE Turow Zgorzelec improved its team weeks ahead to its Turkish Airlines Euroleague debut by adding small forward Christian Eyenga, who penned a one-year deal with the Polish League champions on Monday. Eyenga (2.03 meters, 25 years old) arrives from Stelmet Zielona Gora, where he averaged 9.2 points and 4.7 rebounds in 10 Euroleague games last season. When Zielona Gora moved on to the Eurocup, Eyenga went on to average 9.8 points and 4 rebounds. 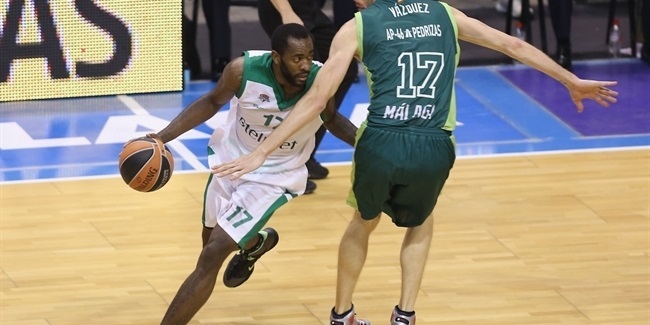 A native of Congo-Kinshasa, Eyenga joined Spanish side Joventut as a teenager and spent three seasons with the club and its affiliate, CB Prat. He made his Euroleague debut with Joventut in the 2008-09 season. Eyenga has also played for Cleveland and Los Angeles Lakers of the NBA, Erie, Canton, Texas and Los Angeles of the D-League and Shanxi Zhongyu of China. An accomplished athlete, Eyenga hopes to keep thrilling Euroleague fans with his outstanding dunks.